President-elect Barack Obama and Vice President-elect Joe Biden lay a wreath at the Tomb of the Unknowns at Arlington National Cemetery in Arlington, Va. on Sunday. 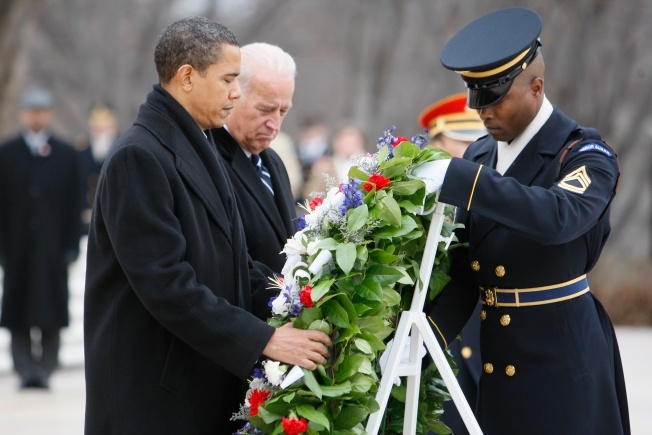 WASHINGTON – Barack Obama laid a wreath at the Tomb of the Unknowns on Sunday, somberly pausing to honor America's war heroes in the midst of a mostly festive weekend prelude to taking on the presidency. The temperature rose above freezing, lending a measure of relief from the frigid weather the Obamas and Bidens braved — along with countless throngs of admirers — during a 137-mile whistle-stop train ride from Philadelphia to Washington on Saturday. Obama's Sunday started quietly as he took a limousine ride to the nation's hallowed burial grounds for the war dead. Onlookers applauded as he passed by. Obama's wife, Michelle, and Biden's wife, Jill, stood nearby as the two men joined Gen. Richard Rowe, commander of the U.S. Army Military District of Washington, for the brief ceremony. At Nineteenth Street Baptist Church in northwest Washington, the congregation erupted in applause when the Obama family walked in, including daughters Malia and Sasha and Michelle Obama's mother. They sat in the second row, which had been set aside for them. When times turn tough and critics sound off, Pastor Derrick Harkins said, Obama should turn to the strength of his wife and to God. "Understand that God has prepared you, and God has placed you, and God will not forsake you," Harkins told the incoming president. One worry seemed to be under control. Obama's soon-to-be White House press secretary pronounced the boss relieved to already have a version of Tuesday's inaugural address down on paper. Robert Gibbs said on "Fox News Sunday" that the speech would stress responsibility and openness — words that Obama emphasized along the train route in Philadelphia, Wilmington, Del., and Baltimore the day before. Another top Obama adviser, David Axelrod, said the new administration would approach weighty problems with a blend of "optimism and realism." Axelrod said a priority would be to "put the brakes" on the economic slide and avert a double-digit unemployment rate. The country is in a deep recession, and the jobless rate — at 7.2 percent — is the highest in 16 years.